Monster in the Closet is a spoof on 1950s monster movies and their extreme straitlaced paranoia. A monster comes out of closets and attacks residents in a small California community a little north of San Francisco. A young man who desperately wants to become a journalist gets the story as a prank from an office rival and goes up to investigate, where he meets a pair of biology professors, the town priest, a little boy, and a constantly spitting sheriff. Soon the monster is revealed, the military arrives, and everyone quickly find all of their weapons are useless. It comes down to the astonishingly handsome journalist, the attractive blond professor, and the little boy to overcome the monster…and they fail too. Despite this, the film has a happy ending once people realize all they have to do to defeat the monster is destroy their closets! Yes, it’s stupid…though it’s also very good in parodying much of 1950s film and the anti-Communist mentality of the time which made us take terrible ideas and package them in messages that were simplistic, fantastical, propagandistic, and flat out dumb. Think the horror movie equivalent of Duck and Cover. This picture was obviously made by someone who knew the types of movies he was aping, and Monster in the Closet comes replete with numerous send ups, references, and homages to classic horror films as well as serial series and comic books. For example, there is a five minute parody of the infamous Psycho shower scene. The lead journalist is a bespectacled everyman named Richard Clark of the Daily Globe in a very subtle Superman reference. Hell, the movie ends with “‘Twas beauty killed the beast” right out of King Kong. There are also quite a few stars of the 1940s, ’50s, and ’60s, including John Carradine, Claude Akins, Henry Gibson, Howard Duff, and Donald Moffatt. I’ve said before that a movie made with love appeals to me, and this feels like one that was made with love. Overall I thought Monster in the Closet was delightful. It’s not something I’d consider the best ever, but it does what it does, and it does it well. It’s consistently entertaining, though it doesn’t exactly inspire fear. While I never really found it laugh out loud funny, it has enough humor to keep things interesting. I appreciated the monster design (particularly once I discovered it was the phenomenal Kevin Peter Hall in the suit) and had a good time. That’s about all I could ask for. This movie is a love letter to so much that I adore, so I forgive it of its faults. Also the kid in this movie nicknamed “Professor” was actually a very young Paul Walker in his first role. This was also the first film role for singer Fergie of The Black Eyed Peas, though she already had some experience doing voice acting and television work. 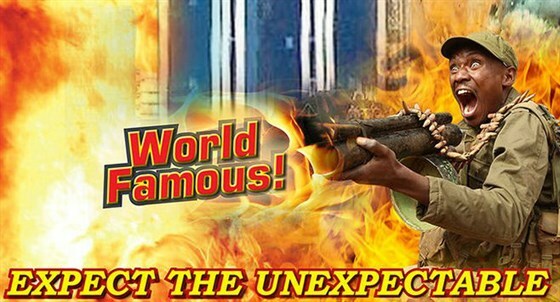 I love it how a Troma film can capture the very best and the very worst of all of film and entertainment.